and stimulus spending, they do so with good reason: the latest public opinion poll from the Angus Reid Institute finds vote intention at the end of the first month of the federal election campaign correlates significantly with Canadians’ personal economic circumstances. ARI’s analysis of survey data also shows roughly twice as many Canadians see themselves falling behind as see themselves getting ahead day-to-day, year-to-year in this economy. It is this cleavage that speaks to party fortunes. Indeed, counting all respondents who choose either “the economy,” “jobs/unemployment,” or both, the number of Canadians expressing concern about the economy jumps to more than half: 55 per cent. Are Canadians better or worse off? Are Canadians optimistic or pessimistic about their economic futures? Similarly, two-in-five Canadians (39%) believe Canada’s economy will worsen over the next year, compared to a quarter (25%) who think it will improve. Roughly a third (36%) believe it will remain the same. What does this mean for the 2015 election? Using these questions, the Angus Reid Institute has developed an index that scores respondents based on their positive, negative, and neutral answers (see notes on methodology at the end of this release). The Getting Ahead – those who tend to think things have gotten or are getting better economy-wise – represent roughly one-in-six Canadians (17%). They tend to be more certain or “locked-in” when it comes to vote intention, and are more likely to prefer the Conservative Party of Canada (CPC), but not significantly. The Falling Behind – those who take a more negative view of the economy, generally – are more than twice as large, representing some 36 per cent of the population. They tend to be older, less certain that they won’t change their mind on vote intention before the end of the campaign, and as of today, choose the NDP two-to-one over the CPC and the Liberal Party of Canada (LPC). The Staying the Same represent the largest group, by far: almost half (47%) of respondents fall into this category. They are fairly evenly spread across age demographics, generally disapprove of CPC leader and Prime Minister Stephen Harper, but still pick the Conservatives a close second in vote intention (which, like the Falling Behind, is less certain, or “locked-in”). As of the last week of August, the Angus Reid Institute finds the New Democratic Party leading the overall race among likely voters, with 36 per cent of the total vote if the election were held tomorrow. The Conservative Party of Canada is four points back, at 32 per cent, and the Liberal Party of Canada is at 23 per cent. 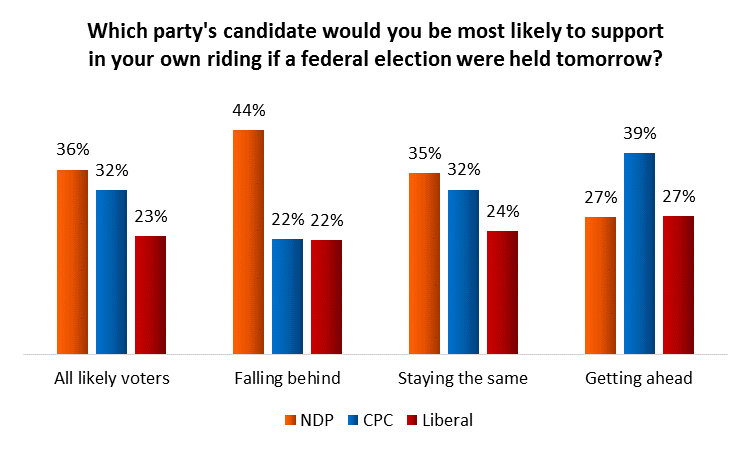 Unsurprisingly, the largest segment, the Staying the Same, breaks down along roughly the same lines when undecided voters are removed from the equation: 35 per cent say they would support the NDP, 32 per cent the CPC, and 24 per cent the LPC. The one-third (36%) of the electorate that sees itself falling behind give a significant edge in their intended vote to the NDP. Support for the New Democrats among this segment doubles that of each other party (44% NDP; 22% CPC; 22% LPC). Among the sixth of the population that is Getting Ahead, results are nearly the opposite: Harper and the Conservatives lead, with 39 per cent of this segment’s vote, and the NDP and Liberals are tied with 27 per cent each. It should be noted that the Getting Ahead are significantly more certain about the party for which they intend to vote than the other two segments: Just 5 per cent of this group is undecided, compared to 11 per cent of the Falling Behind and 13 per cent of the Staying the Same. Looking at the question of certainty another way, almost two-thirds of the Getting Ahead (63%) say they are “very certain” about who they would support if the election were held tomorrow. Less than half of the other two segments say the same (49% of the Staying the Same and 45% of the Falling Behind say so). Perhaps predictably, given their preference for the CPC, those in the Getting Ahead segment are much more likely to have a favourable opinion of Stephen Harper than those in the other two segments. Half (50%) of the Getting Ahead have a favourable view of Harper, while 39 per cent of the Staying the Same and 27 per cent of the Falling Behind report the same. Interestingly, this relatively higher favourability for Harper among the Getting Ahead segment does not equate to lower favourability for other leaders. Indeed, six-in-ten (61%) of the Getting Ahead have a favourable view of Mulcair, and 55 per cent have a favourable view of Justin Trudeau. This large reserve of good will for Harper among the Getting Ahead translates into a commanding lead for the Conservative leader among this group when it comes to who would make the best Prime Minister. Some 37 per cent of those in the Getting Ahead segment say Harper would make the best PM, 12 points ahead of Mulcair (25%) and 16 points ahead of Trudeau (21%). The Getting Ahead group is also more inclined to say Harper is the best party leader on the issue of the economy. Fully two-fifths of the group (40%) do so, nearly double the percentage who say Mulcair would be best on the economy (22%). Mulcair leads on this question among the Falling Behind, with 29 per cent of that group saying he would be best on the economy, compared to 22 per cent who say Harper. One of the most interesting sidebars to this analysis is the fact that the group that skews younger – the Getting Ahead – is also the group that skews more Conservative. In most polls, the Conservatives tend to draw more support from Canadians over age 55 than from those aged 18 to 34. Indeed, this is the case among the overall population in this survey as well. Among all eligible voters, excluding those who are undecided, the over 55 are significantly more likely to support the CPC (35% do so, compared to 23% of the 18 to 34 age-group). What’s unusual about the Getting Ahead group is that it captures a large number of young Conservatives. Excluding undecided voters, fully one-third (34%) of those aged 18 to 34 in the Getting Ahead segment say they support the CPC – more than the 30 per cent who support the NDP and the 28 per cent who support the LPC. So, while younger people are generally more likely than other age groups to feel like they’re Getting Ahead, it’s specifically young Conservatives who are most likely to feel this way. The opposite is also true: While younger people are generally less likely than other age groups to feel like they’re Falling Behind, those who do feel that way are overwhelmingly NDP supporters. All things considered, do you think your current standard of living is better or worse now than it was a year ago? And a year from now, do you think your standard of living will be better or worse than now? Over the next twelve months, do you think the economy of your own province will improve, remain the same, or worsen? Over the next twelve months, do you think the Canadian economy will improve, remain the same, or worsen? A positive answer – such as saying one’s current standard of living is better than it was a year ago – received one point. Negative answers – such as saying one expects the Canadian economy to worsen over the next year – received negative points. Neutral answers – saying things will or have stayed the same – received no points. Respondents were then sorted according to their total score – ranging from -4 to 4. Those receiving a -4, -3, or -2 – meaning their negative responses outweighed their positive responses significantly – comprise the “Falling Behind” category. Those receiving a 4, 3, or 2 – meaning their positives outweighed their negatives – comprise the “Getting Ahead” category. Those who received the remaining scores – -1, 0, and 1 – make up the “Staying the Same” group. The data from all survey respondents or “eligible voters” uses standard census-based targets to ensure a national sample that is representative of the adult Canadian population as a whole by key demographics such as gender, age and education and region. For the vote projection numbers, we also report on “likely voters” where we’ve applied a weighting structure that further adjusts our sample to reflect known variations in voter turnout – specifically across age groups – while also filtering based on respondents’ own reported past voting attendance. In this release, almost all reported results reflect eligible voters. When the likely voter model is used, it is labeled as such.